Product prices and availability are accurate as of 2019-04-18 15:34:18 UTC and are subject to change. Any price and availability information displayed on http://www.amazon.com/ at the time of purchase will apply to the purchase of this product. It's all about the romance! Our Amour Lace Wedding Gown is simple, yet exudes stunning elegance with a fit and flare silhouette and beautiful scalloped lace. The waist is defined with a ruched waistband and the pull-over style is easy and relaxed, so you can enjoy your day in comfort. Love is no longer a battlefield when you're dressed in your stunning wedding armour. Self: 75% Stretch Nylon, 25% Rayon; Contrast & Lining: 95% polyester, 5% Spandex. Dry clean only and do not steam, warm iron can be used when needed. Made with love in the U.S.A. Elegant design with a fit and flare silhouette. 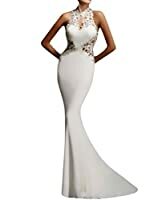 Perfect for the elegant bride. 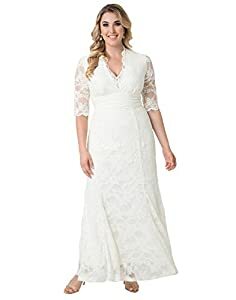 Beautiful scalloped lace on neckline and sleeves 2x measures approximately 61 ½" from high point of shoulders to hem Dry Clean Only This wedding gown will be delivered with a red Sharktag attached, with instructions for removal included. If the Sharktag is removed, the gown cannot be returned.